Hello everyone. We’re on the countdown to New Zealand Babywearing Week (10 – 16 October 2011) and we are looking forward to celebrating with you. Over the next few weeks we will be continuing our fantastic giveaways thanks to some generous product sponsors. The next giveaway will be drawn once we reach 700 page members over on the New Zealand Babywearing Week facebook page. Our 700 liker giveaway sponsor is Moby Wrap NZ (a subsdiary of Scarecrow Farm). One lucky ‘New Zealand Babywearing Week Facebook page’ member will be randomly drawn to take home a classic Moby Wrap in the colour of your choice valued at $71.50. (Open to NZ residents only). The design of the Moby Wrap uses your entire back, as well as your shoulders, to carry the weight of your baby. Unlike other carriers, which have narrow straps or go across one shoulder, the Moby Wrap is a wide piece of durable, high quality fabric that is wrapped over both shoulders. It is amazingly comfortable and easy to wear. There are no buckles, snaps or other fasteners (that may break or bend). It is easy to adjust the fit of your Moby Wrap by varying how tightly you wrap yourself and baby. Moby Wraps are one size which means all caregivers can easily and comfortably share one wrap. 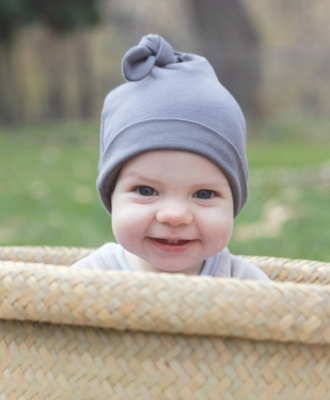 Moby Wrap NZ are offering a free Moby Knot Hat to followers of New Zealand Babywearing Week when you purchase a Moby Wrap between now and 16 October. To take advantage of this offer simply tell us what colour and size you would like in the comments box at the checkout when you order through www.mobywrap.co.nz or www.scarecrowfarm.co.nz. (Not valid with any other offer). This entry was posted in Giveaways and tagged babywearing, giveaway, moby wrap, mobywrap, stretchy wrap. Bookmark the permalink. Id like to win because I am due in 8 weeks with baby number 2 and being a solo mummy I cant afford a pram with toddler seat. I would love to win a Moby wrap so I can enjoy more cuddles with my little man while getting stuff done! Thats a moby wrap 🙂 silly predictive text! I’ve got so many pregnant friends who need “enabling”, and a stretchy wrap is one of my fave gateway carriers!! I would love one of the Moby wraps to keep my newborn happy while I deal with Mr almost 3 years! A mum never seems to have enough hands!! I would love a Moby to help hold by baby close while playing with my busy 22month old! I would like to win a Moby wrap as ive never tried one before – thinking Im a plus sized mumma and that it would be too hot or not fit etc- plus not being able to afford one! Im pregnant with twins (3rd and 4th kids!) and saw the twin wrap on the Slingbabies page and it looks great and I would love to try it when the girlies arrive! I have only just realised that it is possible to put my one year in a wrap. The one that I currently have, is a bit stretchy and out of shape as I bought it second hand of a friend of a friend. Would love a Moby wrap for my little one who is due next year. I want to create that 4th trimester feeling for my newborn while still being able to run after my toddler! I am baby wearing obsessed! And it would be so nice to have a new wrap to keep handy as I only have a frontpack that my sister gave me . I’d love to wear and cuddle my baby while getting things done. Would love to win a Moby as the one I have is only a home made one and the fabric is a bit stretchy. the moby fabric is a lot firmer and I could carry for longer (age wise) with it. I would love a Moby wrap as i tend to have prem babies and would love the extra bonding you can get when you are able to hold them close to you or skin to skin when using a Moby wrap. When you have a prem baby you miss out on alot of the bonding time as they are out of the womb early and usually in an incubator for at least a few weeks, so to snuggle with them in a Moby wrap would give some of that bonding back that i felt my two prem boys and i Missed out on as Moby wraps were not available when they were born and if they were i hadn’t heard of them can’t wait to use one for this baby! I have an amazing friend who is having baby #3 and She sooo deserves to wear her baby, I really want to win this for her! She is an amazing mum who has 2 boys and home day care as well. She has had trouble in the past with her other children being early this would be the perfect gift for her. I would like to win this as I have twins and a baby, would be nice to have something to hold Millie in while I’m juggling the twins! When Millie gets too big I will pass on to my brother who is due to have a baby very soon, or he might like to buy himself a new one! I’m due on the 12th Nov and would love this for our baby. My husband already loves carrying around our nephew so I’m sure he would love to use one of these as would I.
I would love to win this as I am due in early Dec and have always wanted to wear baby, it looks so comfortable and easier than lugging a pram around public transport. We are also having trouble with finances so can’t really afford to buy new. Would love to win a Moby so I can wear my bub due in March while playing with my daughter making Playcentre so much easier! Would love to won this.I’m due next thursday with baby number two and this would help alot.i wanted one with our daughter but couldn’t afford it so fingers crossed. i would LOVE to win a Moby, im due on the 13 oct and it would be such a awsome help with running around after a four year old! 2 boys with another child on the way… a wrap is a great way of staying close with bubs while getting all the never ending jobs of a mother done…. plus they are super cool!